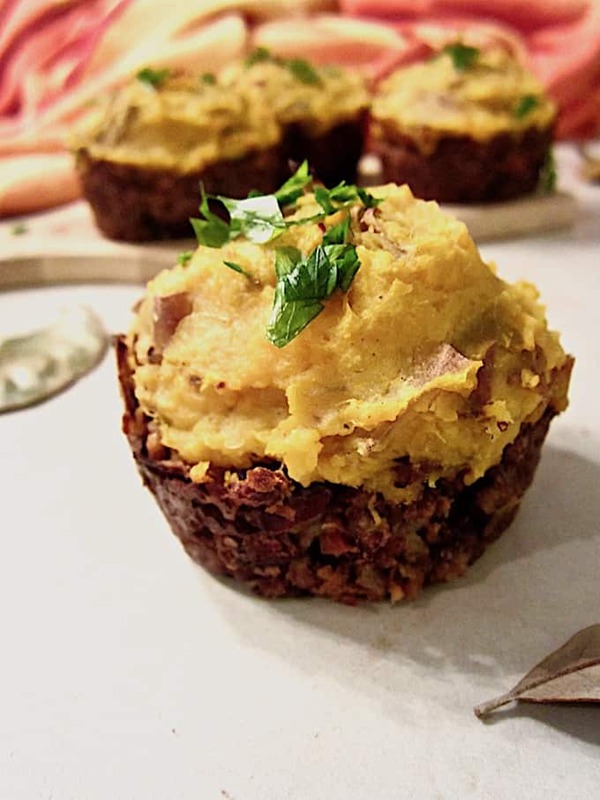 Shepherd’s Pie meets Vegan Meatloaf in these vegan and gluten free Shepherd’s Pie Savory Mini Cakes! 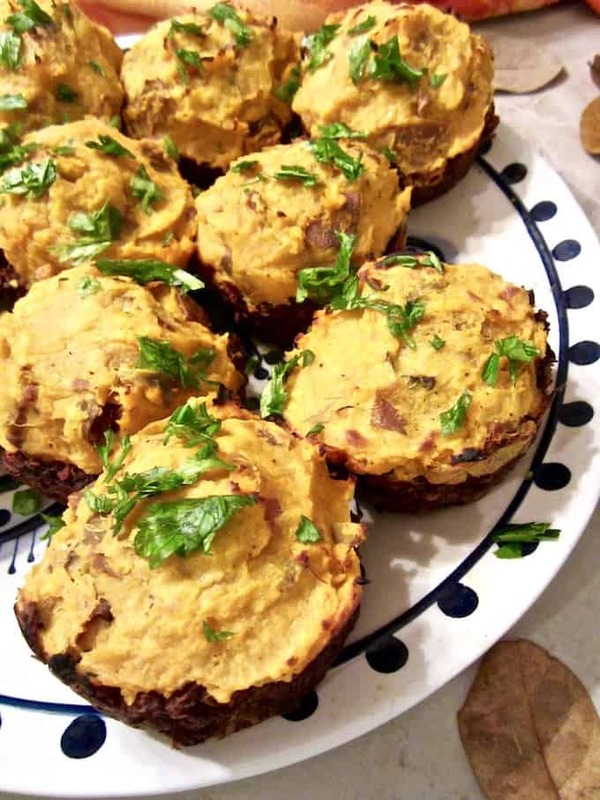 With a mix of veggies, beans, nuts and breadcrumbs on the bottom, covered with mashed sweet potatoes on top, this recipe delivers a savory and satisfying main dish component to any holiday (or non holiday!) meal! If you’re looking for a vegan, gluten free or just healthier option for your Thanksgiving or Christmas table, this is it. You can even make the veggie and bean base for this the day before, if you’re planning a big meal and need to break up the cooking. 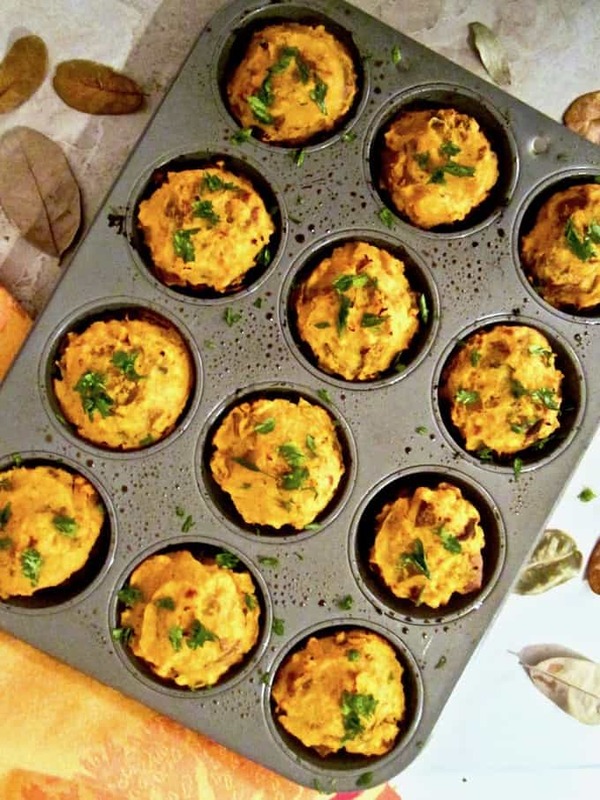 Just pop the muffin pan back into the oven to warm up, and then broil with the additional of the potato topping before serving. Depending on my mood I like this served with any of the following: ketchup, whole grain mustard, hot sauce or my delicious Mushroom Gravy. 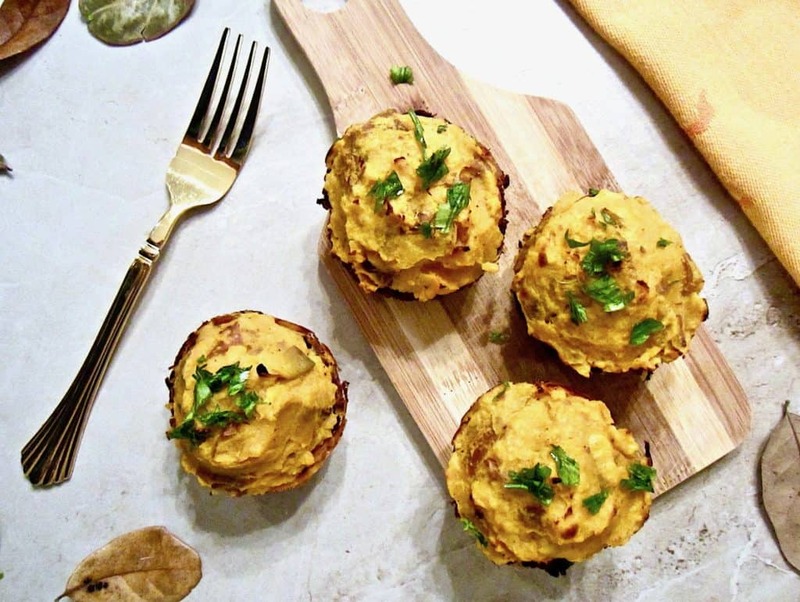 This is a super healthy recipe with each serving (2 cakes) containing 21 grams of protein, 24 grams of fiber and 0 cholesterol – plus 110% of your Vitamin A serving for the day, 52% of Vitamin C, 40% of Iron and 22% of Calcium! Sauté onions, celery, carrots, pepper and garlic until just softened. 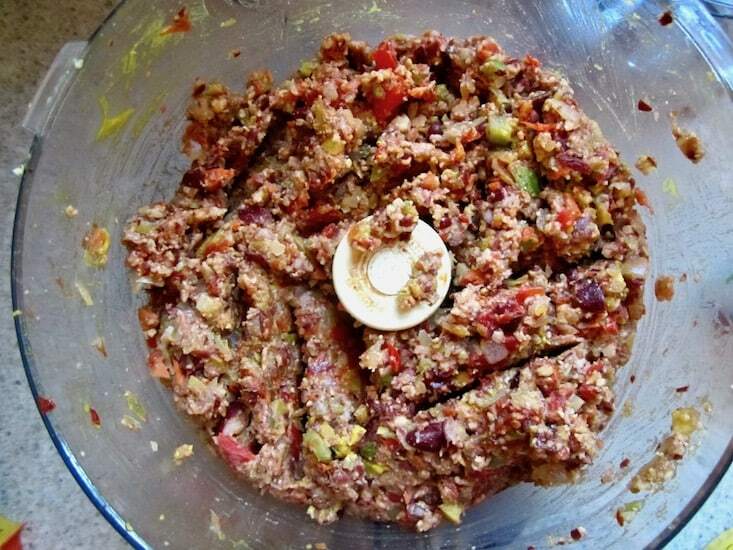 Place the sautéed veggie mixture, kidney beans, walnuts, Gluten Free Panko Breadcrumbs and other remaining base ingredients into a food processor and combine. 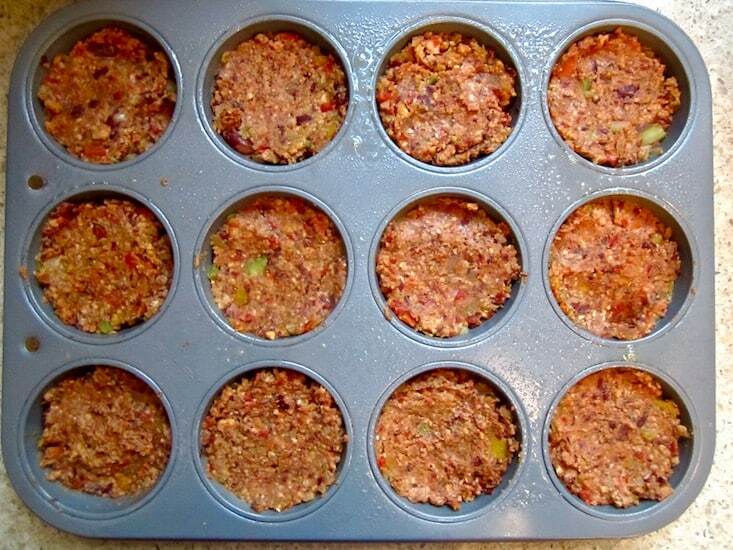 Place mixture into muffin pan and bake. 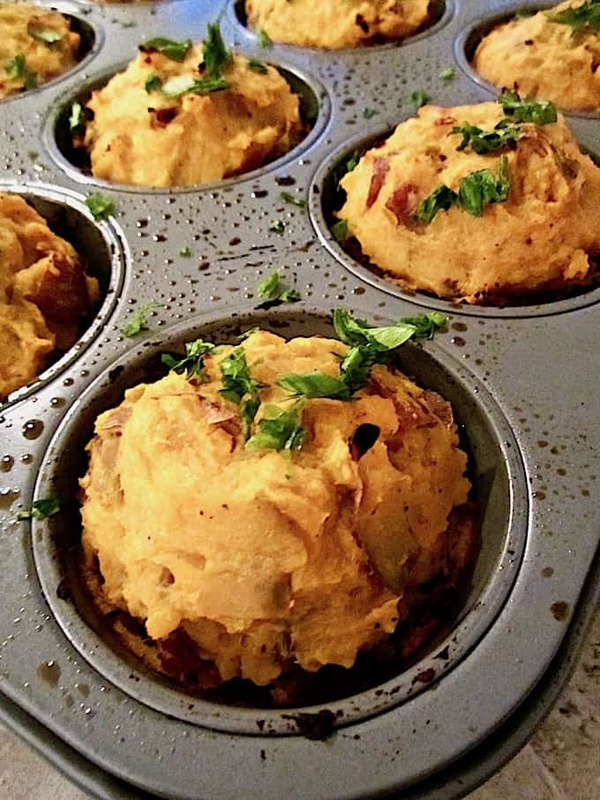 Top with mashed sweet potatoes, broil and top with fresh parsley. Ta da! Done. If you can’t find Gluten Free Panko breadcrumbs (I used Ian’s Brand ), you can order them on Amazon, substitute other (non Panko) gluten free breadcrumbs, or make your own by lightly toasting your favorite bread and then pulverizing it in a blender or food processor. You could also try subbing oats, but I haven’t tested that version myself. Shepherd’s Pie meets Vegan Meatloaf in this satisfying main dish for any holiday (or non holiday!) meal, with 21g of protein per serving. Sauté onion, celery, carrots and pepper on med-high heat in skillet with water or low sodium vegetable broth for 5 minutes, until just softened. Add in garlic and cook another 30 seconds. 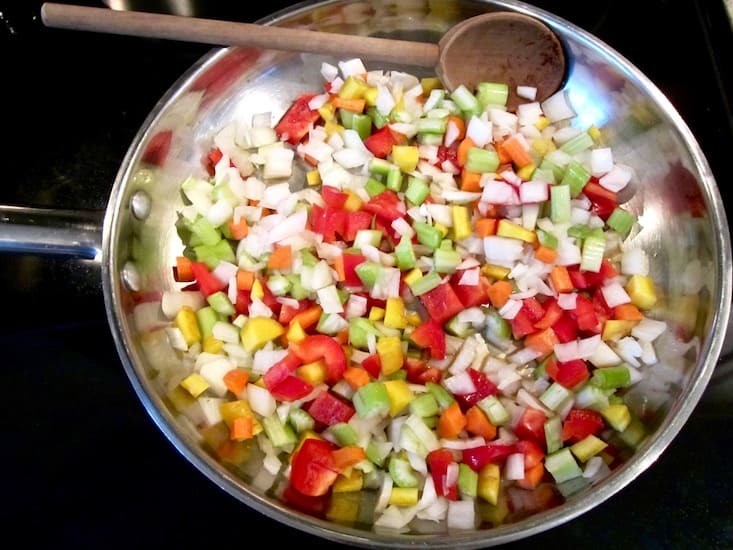 Place the sautéed veggie mixture and remaining base ingredients into a food processor and combine until mostly finely chopped and mixed into a patty-like consistency. You may need to do this in batches if you have a small processor. 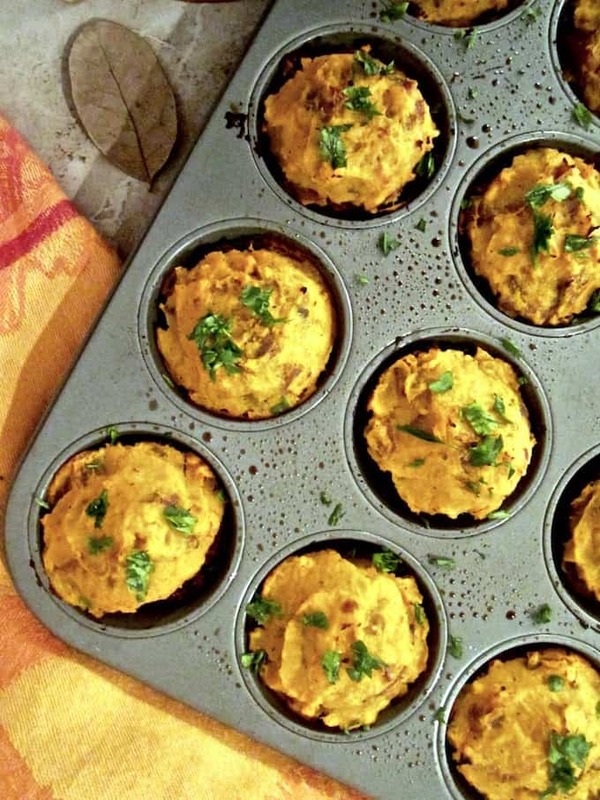 Grease your muffin pan or use non-stick silicon muffin pans . Place mixture into the cups and push down with the back of a spoon so the mixture is firmly in place and compact. While the cake base is in the oven, boil the sweet potatoes in a large pot of water until tender. With a stand mixer, electric mixer or hand masher, add salt and almond milk until creamy. If desired, add olive oil or butter for extra creaminess. After the cakes have baked for 40 minutes, remove from the oven and turn oven to high broil. Add a mashed sweet potato mound on top of each cake, evenly distributing the mash among all 12 cakes, and smoothing with a spoon (or alternatively you can use a piping bag if you have it). Broil on top oven rack until sweet potatoes are golden on top, about 3 - 5 minutes depending on your broiler. Allow to cool a few minutes and add chopped parsley before serving. *For nut free: omit walnuts. **If you can’t find gluten free panko breadcrumbs , you can substitute other gluten free breadcrumbs or make your own by lightly toasting your favorite bread and then pulverizing it in the blender or food processor. You could also try subbing oats, but I haven’t tested that version myself. Hi! I am looking for recipes that I can make ahead of time and freeze for those busy tired nights. Would this be a good one? Do you have freezing/thawing instructions? I don't see why not! But I've never frozen these so am not sure. I'd probably reheat on 350 - anything above that may dry them out. Hi! I just made this for a potluck and am excited to try it. I wanted to mention, though, as I went through the recipe, I found a couple of issues. One is that the single asterisk next to the walnuts refers to a note that states the recipe can be nut free if omitted, but the recipe also calls for almond milk, so a substitute for both of these nut items would be needed (I tried soymilk). Also, the recipe title says it's vegan, and most vegans will know and can adjust, however, if someone is not vegan and cooking for someone who is may not know that the option to add butter or oil to the topping is not vegan. Anyway, I'm hoping this tastes as good as it looks!